I was working recently with a student that I�ve been teaching for more than a year. He was shooting using extreme English on the cue ball, but he was aiming for a point on the object ball that was directly into the pocket. Naturally, he overcut the shot badly. He did it over and over, thinking that something was wrong with his stroke. What my student wasn�t taking into account, of course, was the deflection that occurs when you strike the cue ball to the left or right of its center. If you use extreme right English, the path of the cue ball is going to deflect to the left. If you use extreme left English, the cue ball will veer to the right. How far to the left or right the cue ball deflects is something that will be different depending on the rigidity of the shaft you have on your cue. One of the things you need to understand is how much deflection your particular shaft has so you can learn how to compensate and consistently make the proper correction in aim. The diagram shows a good reference shot for deflection. First, aim at the shot as if you were shooting a stop shot. Obviously, you would hit the 8 flush and send it directly into the bottom rail. 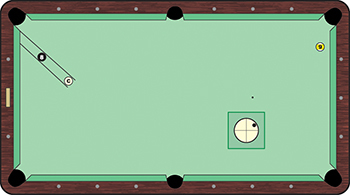 Now, since you want to use extreme right English on this shot (see cue ball inset), simply move your entire cue on a parallel line to your intended contact point on the cue ball. Aim to hit that same spot on the object ball. If the result is that you hit the 8 ball flush, then you know how much deflection your shaft has. Adjust until you consistently pocket the 8. The points are going to vary from shaft to shaft, but a drill like this will help you determine how much deflection your shaft has and how much of an adjustment you must make on shots using extreme English.